The Denver Broncos open the season at home Sunday in a West Coast premiere matchup against the Seattle Seahawks. With a $367 average asking price on the secondary market. 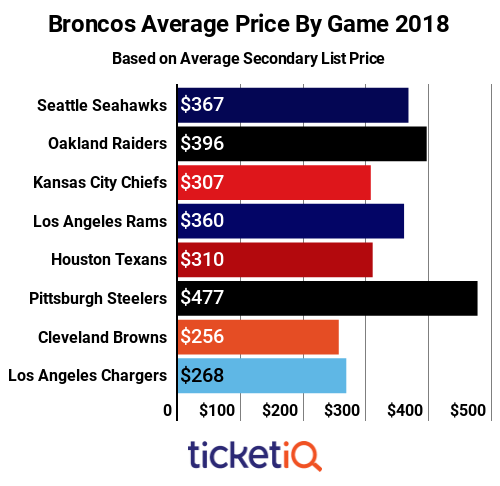 Below is how Broncos ticket prices stack up on the secondary market across the league. 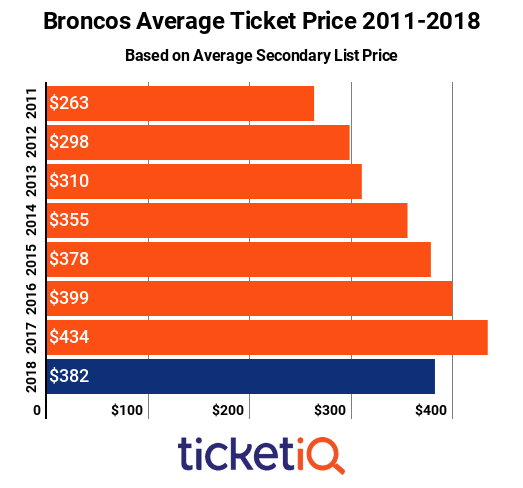 As you can see below, 2018 Denver Broncos tickets are down 12% compared to last season, and are third most expensive since 2011. They're also the second highest in the NFL this season behind only the New England Patriots. The most expensive ticket of the decade was last season, two years removed from the Broncos last Super Bowl win. Prices trended up from 2015 until 2017, when they reached a high of $434. With a $382 average asking price, Broncos tickets are ranked No. 2 in terms of price across the NFL. Only the New England Patriots tickets, at a $501 average asking price, are higher. Season tickets are available through the team website, and fans can take advantage of variable pricing with a season ticket package. Single-game seats are available through the Broncos partner, Ticketmaster, for all games, though some are resale tickets and others are primary market tickets. For the Monday Night Game October 1 against the Kansas City Chiefs, primary market tickets are available for $105 vs. a $120 get-in price on the secondary market. In addition, tickets throughout the stadium are available for all games through secondary ticket marketplace TicketIQ.com, with the company’s Low Price Guarantee. The priciest game of the season at Mile High is the November 25 Pittsburgh Steelers game, which is trending at $477 on the secondary market. The next most expensive game is the Week 2 meeting with the Oakland Raiders, which has a current average asking price of $396. The Broncos and the Steelers have a rich rivalry that dates back to the John Elway era and stretches into the current decade when the Broncos eliminated the Steelers from the post season twice, including in 2015 on their way to a Super Bowl victory. Surely, if both teams are playoff bound – or nearly so – prices will rise even more.